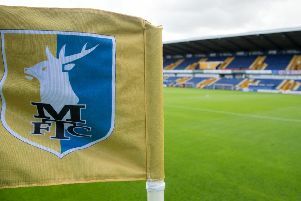 Mansfield Town’s new boss Adam Murray beat international managers to the hot seat as the man in charge of the Stags, the club has revealed. John Radford said: “We interviewed a lot of experienced managers. We also had international managers and players who applied for the job and gave good interviews. However, I would say that Adam’s was 20% or 30% better than anyone else’s and I’m sure he’ll do an excellent job. “He bleeds amber and blue, has captained us to a league championship, and has always had a special relationship and affinity to the club and town. “His enthusiasm is second to none and he shares my ambition of seeing the club progress. As for the new manager, he was clearly delighted with his new job. “This is the proudest day of my career to date,” said Murray. “ I’ve got great belief and confidence in my own ability and I believe it was the right time for me to step up as manager. “We’re in a transition period as a club. We’ve had successful seasons in the past few years but I think now we need a fresh outlook and philosophy in order to move on to the next level. “So far, I have tried to give the players the confidence to express themselves and the emphasis in the training sessions has been on being brave in possession and evolving our style of play, while at the same time understanding that it’s a results-based business and we need to pick up points to climb the table.